Summer 2016 - Focused on analyzing client research and data to improve user experiences at a brand and creative strategy agency. I worked directly under the co-founder and former VP of Creative for American Eagle Outfitters. His insight and mentorship helped to guide my work throughout the summer. There is limited information about the projects due to a non-disclosure agreement. Everything on this page is public knowledge or permitted to be shown. This was my focus for the summer. When I interviewed for the internship position, my bosses were intrigued by my ability to project concept and my environments background. Environments is the newest concentration offered through the School of Design at Carnegie Mellon University. 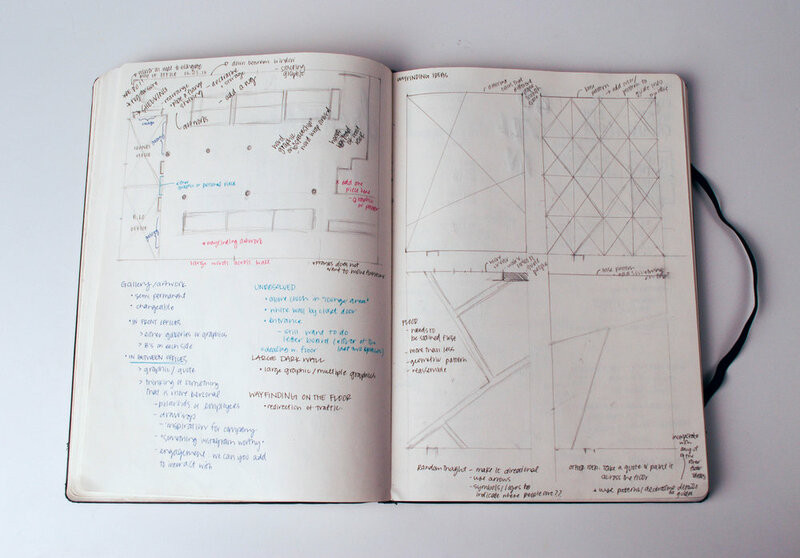 It focuses on the study of space and how people interact within it and how they interact with things in those spaces. The idea of this concentration is to focus more on the experience of design and how it is centered around people. Currently, I am working to balance two concentrations - one in communications design and the other in environments design. This project presented itself as a helpful challenge to be able to do both. When I arrived at Agency 1903 x Where Eagles Dare, their office was set up with work stations on one side of the room and an unfinished space on the other. I worked with another intern to prepare the space and led the ideation for this installation. 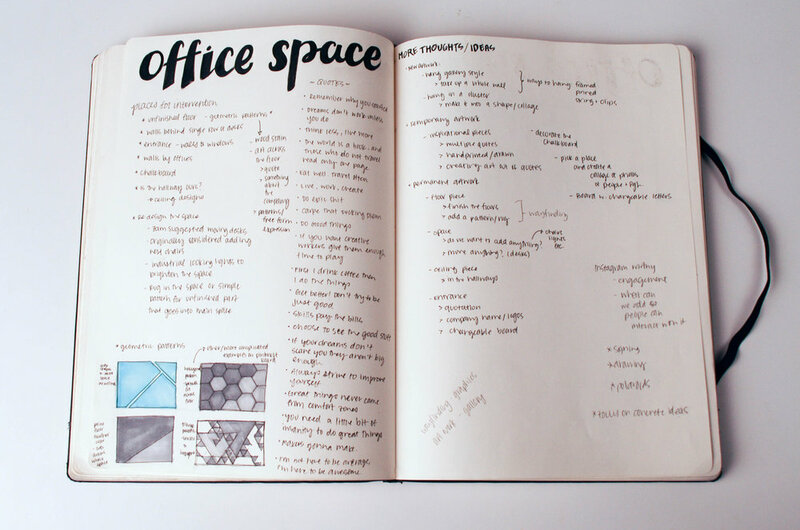 I worked on sketches and proposals for the office to improve their workspace and excite clients when they come to visit. At the end of my internship, visitors were already getting interested in the wall and it felt like I had left my mark on the company. The other intern and I cleaned the space, primed the floors and traced the letters that would be painted. We worked directly under the art director and she had worked on the wall as an example of what she wanted us to create on the floor. To get the letters aligned properly, we had to find a way to project the typography onto the ground. I worked in Illustrator to create files and images that we could use to fix the kerning and adjust the size of the text. We had to align the words so they matched the wall. Our solution for the projection was to hang a small projector from the top of a ladder. We would trace each letter individually and then move the ladder to next position. After all the letters were transferred to the floor, we taped them off and then painted them. This project taught me a lot about teamwork and being meticulous. There was definitely a learning curve to figure out the best way to apply the primer and the paint. We had to make sure the surface we were working on was as smooth and flat as we could get it. 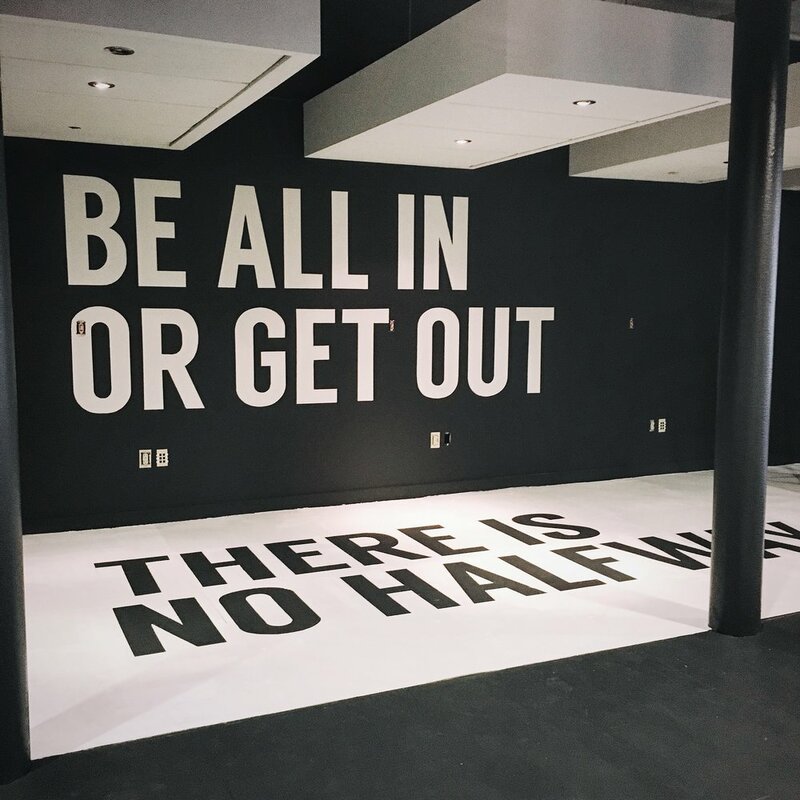 The projection was our biggest obstacle but with some creativity and a lot of tape we were able to successfully create this piece to showcase the motto and attitude of the office. This is a sample of one of the files we started off with. I moved the text into another file to individually space and redistribute the text so we could draw it out. In addition to working on the office installation, one of my bosses had me help with deck/proposal presentations. This involved research and looking into other company practices, very specific information and presenting it in a way that was effective for a potential client. The letter board is another example of a typography exercise. I had laid out several options and manually moved around pieces to see what set and position of the letters fit the best for the signage. I think one of the things I gained from this internship was the encouragement from the people I was working with. My bosses provided me with the freedom to explore and do extensive research in ways that I found interesting. My focus for the summer was on the wall installation and gathering information for client proposals and company projects. 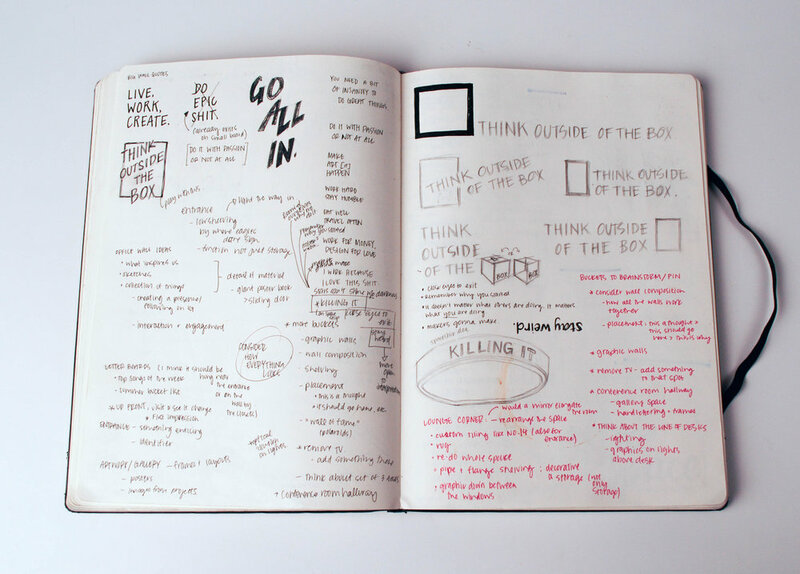 I found that my form of note taking and drawing really helped to present my ideas because it displayed my thought process and made my ideas more tangible and possible. While a majority of what I worked on cannot be discussed, due to non-disclosure agreements, I had the opportunity to be very hands-on and involved with client proposals and research. One of the projects I collected information and data for was a political predictor pet. While the site is currently down, since the election has passed, I researched how people responded to the idea of pets or animals predicting the results of political campaigns, their validity and the hype around this concept. Some of my other research involved gathering content about the presidential candidates so the company would have more information to play with. Additionally, I spent my last week with 1903 x Where Eagles Dare setting up the tank that was livestreamed throughout the campaign and settling in Phin, the fish who "predicts" the presidential election.